The Cow King is an Animal, and a Hell Bovine. The Cow King is the leader of the Hell Bovines, and is found in the Secret Cow Level. See the secret cow level page for full details about how to reach this level. The King is unlike other monsters in that receiving credit for killing him (a somewhat complicated process in multiplayer games) makes it impossible for a given character to open the red portal to the cow level. For this reason it's important for characters who wish to continue playing the Cow Level to be sure they do not gain credit for killing the King. When the King dies for a credited kill to a character, he drops a random array of magical/set/unique items (usually five total) as well as a spray of stamina potions, in an homage to the milk he (she?) would produce were it not a mutated, sexually-ambiguous Hell Bovine. The Cow King's drops are bugged or perhaps intentionally lowered on Hell in v1.10+. The Cow King is always Lightning Enchanted and Magic Resistant. He gains 1 random modifier on Nightmare and 2 on Hell. 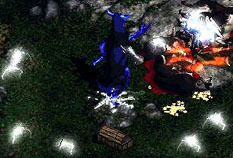 The Cow King adds lightning damage to every attack, as well as emitting sparks when hit. Like most SuperUniques, the Cow King does not regenerate hit points.